Virtual Advent is a blog tour that runs from December 1st through 24th. On each of these days one or more blogs will post about a Christmas tradition, memory, or anything Christmas that they want to share. An annual tradition at my house, along with baking Spumoni Cookies for Christmas Day, is making peanut butter suet, a tasty treat for the birds that visit my backyard. In colder weather birds need to burn more energy to stay warm during the night and this year is already harsher than usual. This means birds need to eat more food to replenish their fat supply. 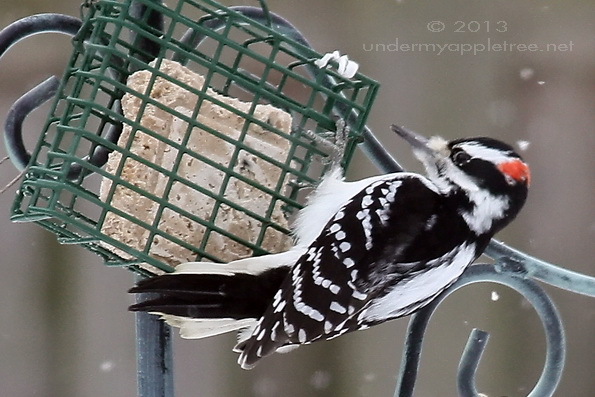 Suet is a high energy food and a favorite meal for many birds, especially the woodpeckers, nuthatches and chickadees. Sure, you can buy suet in the store, but I’m sure this tastes better and it’s my Christmas gift to my feathered friends who bring me joy all year. The recipe is simple and only takes a few minutes to make. I’d like to take credit for it, but years ago I found the basic recipe in Bird Watcher’s Digest. I made a few changes by substituting vegetable shortening when I don’t have lard and adding some seeds and nuts. Melt peanut putter and shortening or lard in large pan on low heat. Add remainder of ingredients and mix well. Pour into a pan and allow to harden at room temperature. Instead of a pan, I re-use the plastic molds that the store bought suet comes in. 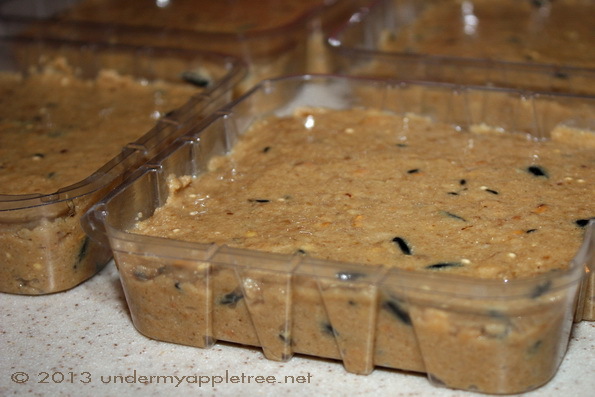 This recipe will make four or five suet cakes. After cooling the suet can be chopped into chunks or squares or served crumbled in a shallow dish. Another option is to press chunks into holes drilled in a piece of dead branch and hung in a tree. Warning: Squirrels also like suet. Store in refrigerator or at room temperature. A Hairy Woodpecker enjoys a snack in my yard. Thanks for the recipe, I’m going to try this!!! You are such a good friend to the birds! No wonder they flock to your yard, giving numerous opportunities for great photos. Thanks for sharing. The suet must be quite a treat for the birds! Lovely photos as usual, Leslie. Ooh! This may be a Christmas present for my dad (and his birds). Thank you for the recipe! How nice of you! We just bought a new house that I am looking forward to making bird friendly in the spring. I will bookmark this recipe. 🙂 Thanks for participating in the tour! I bet the birds love your yard! Oh what a great idea you just gave me! I think I am going to make some of these for gifts. I love giving to the birds! What a great gift for your birds 🙂 It looks easy enough that even I could make it! It’s really, really easy and the birds will love you for it. I put out one store bought suet and one of my peanut butter ones last Saturday and they only ate the peanut butter one! It was devoured in a few days. I will be making another batch real soon.